So many Mondays, we come home and feel too wiped out to cook. We tend to cook a lot over the weekend. On Monday we both come home tired, hungry and wanting to relax instead of preparing and cleaning up after a meal. The obvious result is, many Mondays we go out to eat. We tend not to plan ahead which leads us to pick a place we know well. We often issue last-minute invites to family members in the neighbourhood who might want to join us in making the transition back into the weekday grind a little kinder to our weary souls. The Groveland Tap is right up the street, and it has been a go-to place to meet up for a burger and a tasty beer on these lazy nights. They have great happy hour specials on beer and appetizers that seem always to be going whenever we’re there. The Nook is also becoming a regular in the Monday night rotation. The Nook has a long wait most nights of the week because their burgers are the best. Monday nights they run a $1.25 mini-burger special after 8:30 p.m., but if we arrive a little earlier than that, we’ve managed to sneak right in before the rush for cheap burgers starts. We are lucky to have these friendly, casual spots close home to lean on, and especially grateful that we have friends nearby to join us. The downside is that it becomes a little too easy to get into the habit of never cooking on a Monday. Lately, we’ve been trying to eat a little healthier, and to eat out a little less to help us stick to our budget. This is certainly no Nook burger and fries, but it still hits the spot. It is a simple pasta dish with a chunky vegetable sauce that I’m posting as a reminder to myself that there are some meals that are so quick and consistently delicious that I can even tackle cooking them any night, even on a Monday. This is a meal that comes together up in 15 minutes or less. A pasta with a simple sauce can go any direction that our appetites desire. I grab whatever vegetables I have on hand or that need to be used up. I almost always have fresh mushrooms in the fridge, peas in the freezer because these are staples in my diet, and favorites that are easy to use in many meals. There is alway an onion, some sort of pasta and usually a can of good tomatoes in the cupboard too. If Bjorn is in the mood, it is easy to add chicken or a few frozen meatballs to his plate. Fortunately, Bjorn is happy enough to go without meat fairly often which makes meal preparation even easier. I gather, wash and chop the veggies and get some olive oil heating in a pan. As soon as I remember, I start boiling water for the pasta. Today I opted for Linguine noodles. They cook quickly, and they must be al dente to be any good, so I get the sauce almost ready before starting the pasta. The sauce is simply sautéed onions and mushrooms, depending on mood, garlic. Once those are cooked, I add a can of San Marzano tomatoes and chop them to manageable chunks in the pan. For a canned tomato, San Marzano tomatoes are a little spendy, but they are special, as far as canned tomatoes go. They are only grown in one region of Italy where they get their distinct flavor from volcanic ash present in the soil. They make pasta with tomato sauce more of a taste treat than a simple, plain tomato sauce straight from the jar. There is nothing wrong with sauce from the jar, but ever since I discovered San Marzano tomatoes when I have pasta with tomato sauce, it is what I want to taste. When the sauce is good and bubbly, I salt the pasta water, add the noodles and start a timer. 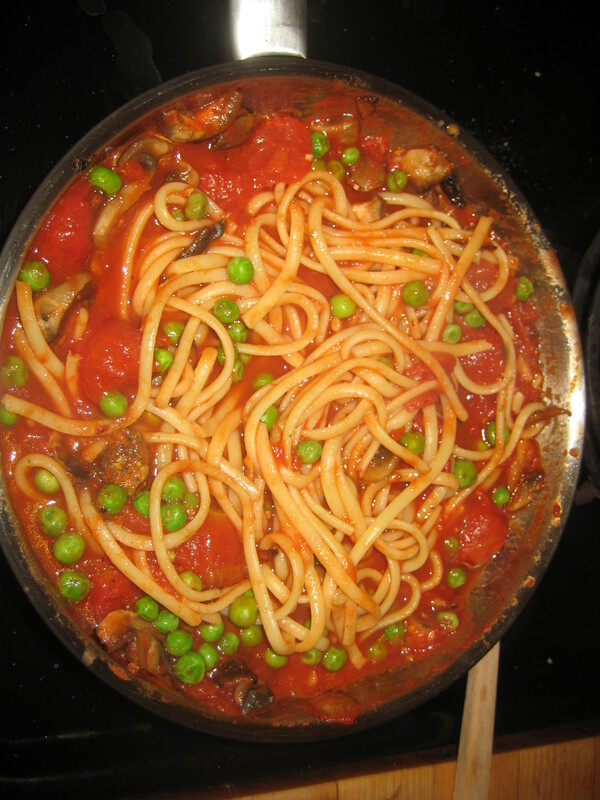 A few minutes later, I add a few handfuls of peas to the sauce. I like to drain the linguine out a little short of boiling time and finish cooking it in the sauce. When I remember to, I reserve a little pasta water to loosen the sauce if I’ve made it too chunky. If the sauce is chunky enough to count as a serving or two of vegetables, I don’t even make a salad. I top the pasta with some cheese and a small handful of fresh basil leaves from our garden. The cheese can be anything from grated Grana Padano to shredded cheddar, although fresh mozzarella is definitely my go-to when it is in the fridge. This meal is so simple, and so delicious. Even on Mondays, I’m running out of excuses not to cook. 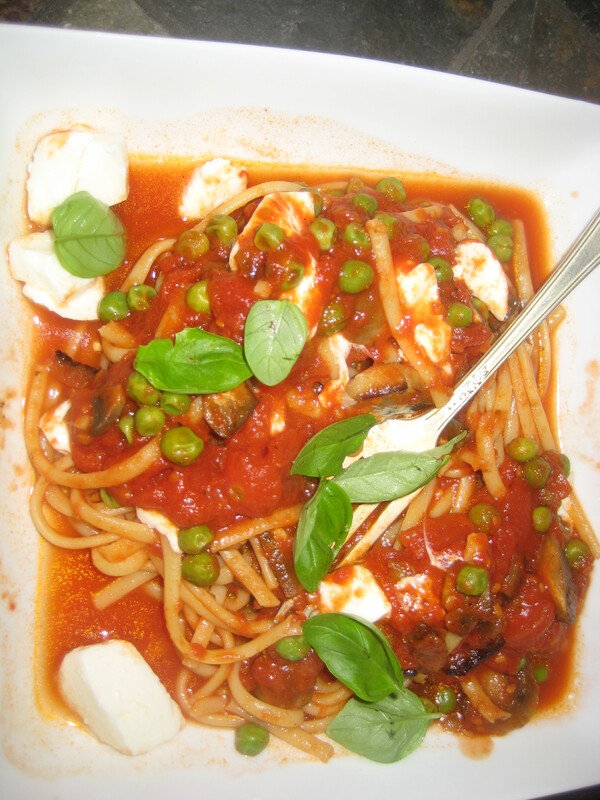 This entry was posted in Pasta, Quick, Simple, Supper and tagged basil, canned tomatoes, Fresh Mozzarella, fresh mushrooms, Frozen Peas, Linguine, onion, San Marzano Tomatoes, simple by Our Way to Eat. Bookmark the permalink.